Named by the Venetians, who always had an eye for the finer things, Mirabello means ‘beautiful view’ – and the striking blue of this sheltered bay, presided over by Agios Nikolaos and Elounda, certainly lives up to its name, with the latter’s beaches and flourish of luxury hotels also winning it celebrity approval. And yet Elounda remains undeniably Greek, both in its architecture and connection with the past. Snorkel over the sunken ruins at nearby Olous and let history catch up with you. Agios Nikolaos, meanwhile, has its own story as the birthplace of Cretan tourism and from lakeside dining to tempting boutiques, its appeal remains undeniable. The antidote to Elounda’s high-society, charming Plaka, loved for its seafood, is just a ten-minute drive away – or a walk along a pretty coastal path. And it's just one of many traditional villages, each with a story to tell. There’s Viannos, which rose from the ashes after the German occupation; Sissi, the pleasant surprise at the end of a winding road, and Vrahassi, a few kilometres east of Sissi, near the well-preserved Agios Georgios Vrahassiotis Monastery. High up on the Lassithi Plateau, you’ll also find, Tzermiado and Katharo, which come to life when the shepherds arrive in May. 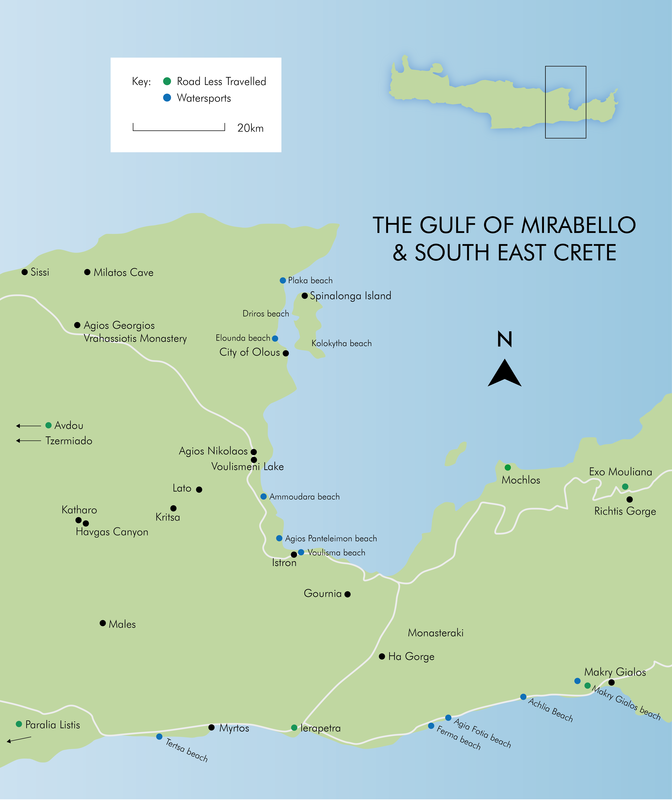 The Gulf of Mirabello is threaded with walking trails including sections of the famous E4 trail, which you can pick up around the Ha Gorge, a deep ravine near the long, straight road connecting the north and south of the island. The domain of experienced climbers and canyoners, it’s one of Europe’s most beautiful gorges; rich in wildlife and home to Mastoras, Greece’s highest waterfall. However, going below ground has its advantages too. There are a number of caves hiding another world within their dark interiors. In the case of Milatos Cave, also known as Rapas, these hidden treasures include a little whitewashed church. While Ierapetra, Europe’s most southerly town, has the cosmopolitan buzz of a port and the swathe of golden sand in pretty Makrigialos’ is a little busier than it once was, Crete’s south eastern coast thrives on its simple lifestyle. Here, small, agricultural communities cultivate their greenhouses rather than tourism, and beaches such as Diaskari, Ferma and Tertsa remain ruggedly, beautifully unspoilt, with one or two traditional tavernas, as friendly as home. And yet it’s far from humdrum. The surrounding, lunar-like mountainscapes make sure of that – or take a boat trip to the delicate pink sands of Chryssi Island or the 36 flawless beaches of Koufonissi and discover a world away from routine, surrounded by jewel-coloured seas. White-painted Myrtos is a bougainvillea-bright highlight of the south eastern coast, its palm-tree’d promenade lined with tavernas and terracotta pots overflowing with flowers. And always there’s the murmur of the sea to remind you that the beach is waiting. Locals welcome guests rather than tourists here, including those at our Myrtos Mare Suites, and there’s a sense of creative, spontaneous hospitality in the hand-painted signs and little cafés and restaurants that pop up wherever they can be squeezed in. The colourful harem-pants and jewellery for sale testify to the laid-back, bohemian vibe and simply soaking up the atmosphere while sipping a drink will always be a wonderful idea. There’s an eclectic selection of local specialities around the Gulf and further inland, including soft mizithra cheese made by the shepherds of the Katharo Plateau – a good place to try grilled goat and lamb – and the sea urchins that flourish in the clear waters around Mochlos: the roe, served as achinosalata, is a delicacy. The international rich-list influence in Agios Nikolaos’ lakeside restaurants has led to more diversified menus, but head away from the busiest tourist regions and the flavours of authentic Crete can be found in abundance, particularly in the traditional fishing villages, where the catch of the day takes central stage, and in the more remote mountain tavernas. The grape spirit of raki goes hand in hand with a Cretan dining experience, as it does across Greece. It’s potent stuff, but usually served with savoury snacks or dessert. Alternatively, a glass of sweet, caramely Metaxa brandy is the perfect way to complete dinner, especially when sipped under a star-filled sky. Traditional Plaka has a host of excellent fish tavernas, the best known lined up along the tiled seafront road and down on the beach, the waves almost at your feet, with spectacular views of Spinalonga. Alternatively, be tempted by attractive Mochlos, which has its own esteemed handful of fish tavernas and a Minoan site as an appetizer. There’s no shortage of holiday-friendly ambience, whether you’re soaking up the atmosphere with a meal next to Lake Voulismeni in Agios Nikolaos’ or lunching in Diaskari on the south coast: a scenic spot with comfortable day beds on the beach nearby for lazy siestas. Further west lies pretty Myrtos, which sparkles into life at night, offering live music until late in some of its friendly tavernas. Heading inland offers a change of scenery and we suggest lunch in the shade of the ancient plain trees beside the fountains in Kritsa’s village square. Or, for more hearty feasts, try authentic Monastiraki or Sissi, which has a good taverna overlooking the saltwater river that runs through the village. An excellent snorkelling spot sheltered by cliffs, peaceful Ferma is the longest of several beaches in a surprisingly green area. It’s made up of sand and small pebbles and slopes gently into crystal clear waters. This beach is a 15-minute drive east of Ierapetra and has plenty of room for parking. You’ll find all the essential amenities within walking distance and natural shade from the trees. Ferma is also home to our Apothikes Beach Suites. Sheltered from the seasonal northwesterly winds, the waters here stay reliably calm and with sunbeds provided by the promenade tavernas and cafés, this sand and shingle spot makes for easy relaxing. The village is a 20-minute drive west of Ierapetra, just off the coastal road. PADI diving courses are on offer here or catch the boat to Chryssi Island for a day away with snorkelling on the side. Reviews describe it as idyllic and this small pebble and dark sand beach is also well organised, including a taverna with beach service. The crystal-clear waters are great for snorkelling. Achlia lies about ten minutes west of Makrigialos and is easily reached from the coastal road. The beach shelves quite steeply beyond the shoreline, so keep an eye on little ones. A family-friendly, well organised stretch of sandy coastline backed by hotels and apartments. You’ll find sunbeds and parasols, as well as a harbour area bustling with cafés and fish tavernas. A 20-minute drive from our Apothikes Beach Suites and a 30-minute drive along the coast from Ierapetra. There’s plenty of parking in the village centre. For those who like to be more active, watersports and volleyball matches are held in the calm waters. Overlooked by several tavernas on the narrow road into the village, this long sweep of sand and pebbles invites relaxation. Climb the small hill at the far end for wonderful views across the bay. Around ten minutes east of Makrigialos, the beach is signposted as you head out of town. Hire one of the beach ‘kiosks’ with their sunbeds, grass-covered roof and hammock, and if you’re near the taverna, you can take advantage of the WiFi too! Echoing the relaxed, bohemian vibe of Myrtos, this coarse grey sand beach has a beach bar and restaurant shaded by tamarisk trees with hammocks, sunbeds and Caribbean-style grass parasols. Tertsa is a ten-minute drive from Myrtos, running parallel to the quiet coastal road. A local yoga school runs drop-in and private classes, so you can enjoy your sun salutations overlooking the brilliant blue sea. A very popular spot for families in July and August, this is the main beach of three in Istron Bay with white sand, clear turquoise waters and great facilities, including kayak and pedalo hire. Within easy walking distance of Istron village with its cafés and restaurants, this beach is a 20-minute drive south east of Agios Nikolaos. A great snorkelling beach, there are also PADI diving courses on offer at the far end, near the Istron Bay Hotel. With shallow waters, wide sands and a sheltered position, Almyros is good for families and watersports. When you order snacks or drinks, you can use the sunbeds, parasols and swimming pools. Less than a ten-minute drive from Agios Nikolaos along the coastal road – or take the footpath starting at Gargadoros, south of the marina. The water can be icy cold in places due to the river, which flows into it all year, forming a serene wetland – with eucalyptus, palm trees and aquatic birds. The town’s main beach is a Blue Flag 200m-stretch of golden sand, with good facilities, a choice of waterfront tavernas nearby and a watersports school for an effortless day by the sea. There are buses from Agios Nikolaos every hour, a 20-minute drive away. The beach gets very busy in high season. If you fancy a change of scene, walk 15 minutes south to see the ancient submerged city of Olous. Small and pebbly, this unspoilt and relatively uncrowded bay comes with natural shade from the local tamarisk trees and some excellent seafood in the tavernas along the seafront. Accessible via a coastal road, Plaka’s beach lies to its west, a ten-minute drive from Elounda. Watersports are on offer here or just enjoy the views out to Spinalonga Island – the famed erstwhile leper colony, also just a very short boat ride away from the beach. Opposite the Spinalonga Peninsula is a small islet where you’ll find this unspoilt sandy beach – the local’s choice – in a rugged natural setting. Beyond Elounda, cross the narrow isthmus with windmills and follow a dirt track to Agios Loukas church, where you can park. From there, it’s a short walk down to the beach. It’s very busy in high season. Get there early and leave when the tourist boats arrive. The flat rocks to the northwest of the beach are popular with nudists. Known as the Hiking Village, bohemian Myrtos is surrounded in walking trails that meander into traditional villages and through breathtaking landscape, but even just a stroll through its pretty hillside streets will set you up for a leisurely beachfront dinner, quite possibly with live music. From summer festivals in the schoolyard to friendly tavernas perfect for dinner, this picturesque, white-painted mountain village is bursting with tradition. It also produces award-winning olive oil, lace and embroidery and, on its outskirts, the Church of Panagia Kera is full of Byzantine frescoes. Picturesque Lake Voulismeni is all about genteel morning coffees and leisurely dinners in your favourite of the many tavernas. You’ll find the loveliest views from the little park above and we suggest arriving around 5pm to fit in a spot of shopping before dinner. Relaxed, welcoming and with a vibrant nightlife, this village resort (also known as Makry Gialos) offers more than golden sands and crystal clear waters. The picturesque harbour is perfect for strolling and there’s a peaceful fresh-fish supper awaiting you on the waterfront. Although the stunning Ha Gorge is for experienced climbers only, novices can still enjoy the view with a relatively easy climb down to the lower entrance, but it’s best to go with a guide. Kritsa, 90cm wide at its narrowest, and Havgas Canyon are less challenging alternatives. Partially covered in cedar trees, Gaïdouronisi (Hrysi/Chrissi) Island has a taverna and beach bar overlooking turquoise waters, with sunbeds on the white sand-and-shell beach. It’s just an hour by boat from Ierapetra and even when it’s busy, you can find a quiet spot. Barren and mysterious, Spinalonga Island, opposite Plaka, was a Venetian stronghold for 150 years. Its ruined buildings are now famous as the leper colony described in Victoria Hislop’s book The Island. Boat trips from Elounda tend to be crowded. Instead, set off from Plaka. Surrounded by the Dikti Mountains, the beautiful Lasithi Plateau is a fertile area of some 25km2, famous for its white-sailed windmills and the Diktaion Andron cave, said to be the birthplace of Zeus. Make time for lunch in one of the many traditional villages. From Kritsa, the road winds steeply up to Katharo, Crete’s highest plateau, with stunning views across to Agios Nikolaos. There’s no permanent community there, but tavernas open in May when shepherds move their flocks up for the summer and there are a number of festivals too. Easter is the biggest event on the Greek calendar, marked by traditional processions, masses and feasting, including the Resurrection celebrations in Agios Nikolaos on Easter Sunday, with the burning of an effigy of Judas and fireworks. The dates of Greek Easter change every year and are often later than Easter in the UK. Feast of St George, the patron saint of shepherds and the military, is celebrated with sheep-shearing contests and feasting. If Greek Easter Sunday is before 23 April, these celebrations are on 23rd, otherwise they take place on the Monday after Easter Sunday. Agios Nikolaos’ Lato Festival peaks in July and August and offers a series of traditional and modern performances from local and international musicians. The Mirabello Jazz Festival, held in Elounda, brings together musicians from around the world – perfect for balmy summer evenings. In Kritsa village, one willing couple open their traditional marriage celebrations to the public. There’s a procession and plenty of singing and dancing. The Celebration of the Shepherd on the Katharo Plateau, with mizithra cheese making and a hearty, meaty lunch with live music. Thousands attend. Three days at the end of the month: The Potato Festival in Tzermiado aims to promote the quality of local produce with music, dancing, food, wine and an award for the largest potato. ‘Oxi’ (Ohi) Day celebrates the Greek refusal of Italian occupation during WWII with marches, parades and much flag flying. Taste the best souvlaki in Greece! There’s a canteen on the beach of Agios Panteleimonas that services up such delicious souvlaki that, in spite of its simple wooden benches and general lack of creature comforts, at weekends, the locals wait patiently in long queues to enjoy their share. A truly ‘in the know’ experience about 2km west of Voulisma. This picturesque fishing village is one of Crete’s least developed, but what it lacks in hotel tourism it makes up for in little-known Minoan sites, family-run tavernas and unrivalled sea views. Mochlos is about 50 minutes from Agios Nikolaos and down a 5km track off the main coastal road. Go to watch the sunset over the beach or on a night of the full moon. On the road to Ierapetra, you’ll discover an ancient village where time appears to stand still. Monasteraki’s few houses were originally occupied by monks, but since the 19th century, the number of residents has dwindled; for some years there was only one occupant. Enjoy a leisurely lunch in one of the few tavernas and the peaceful views over the Ha Canyon. Near the Lasithi Plateau, Avdou is a very traditional village, holding its own little piece of history – but with a difference. There’s a big artistic community here and, as well as giving each of the old buildings a plaque explaining what they were once used for, they host the annual Xanthoudidia Festival, an atmospheric four-day celebration of music and dancing. About 2km from Keratokambos, Paralia Listis is a small, secluded sand and pebble beach with large rocks lying offshore and clear waters perfect for snorkelling. To get there requires descending a steep slope or walking from Kamboula, a beach nearby, but it’s worth the effort. There are caves on the eastern side where, legend has it, an outlaw once lived.